I've had this fleece since 5th grade. I'm now four years out of college (that's 15 years!) and it hasn't begun to show wear. Just buy one. For those of you who still want to know more about this fleece after reading the opening summary, it is true...I've had this thing for 15 years and I've worn it in all sorts of weather doing all sorts of activities. Yard work, hiking/camping, wearing it to football games, you name it. This thing has been with me through lots of life — campfires with friends, long hikes for contemplation, a first date with my (at the time) future wife, and it collected all of the shedding hair from the puppy we brought home a few years back. I've used this fleece pretty hard since I wore it. The fact that it even survived my teenage years is pretty remarkable. There are no fraying ends or splitting seams, and the color has not faded. 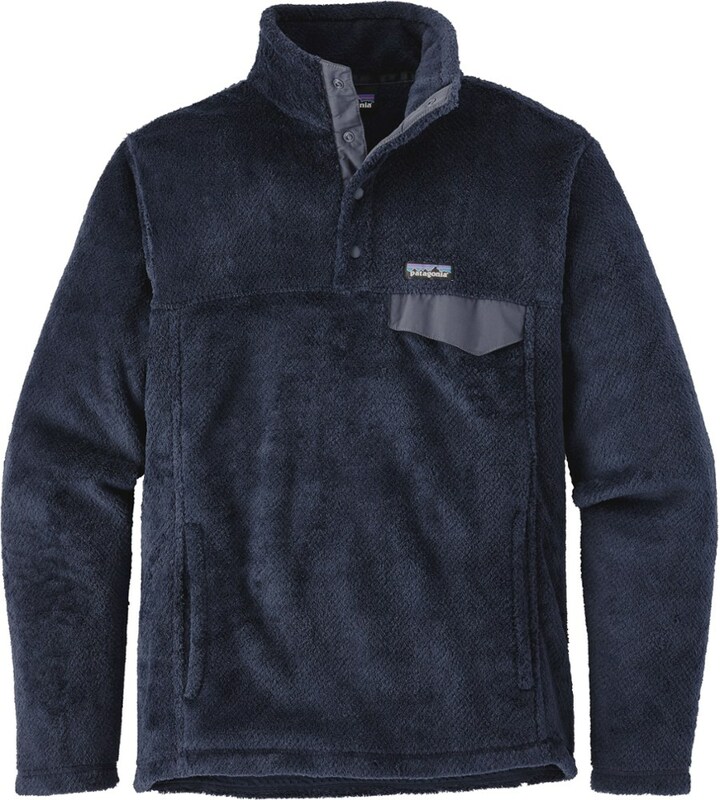 While the fleece is not as fuzzy as it used to be, it still performs the way it always has, and the buttons still work great. The fleece is warm and comfortable. When my grandparents got it for me, they got me a men's medium, which was huge for me at the time, but they knew I would grow into it. And I've almost grown into it...they got me a medium and it's a bit bulky for me through the chest and torso, but that isn't a knock on the sizing. I normally wear small size apparel. Now, I do like that it is just a tad big because I can wear it with layers. I pair it with all sorts of apparel, from wind breakers and rain jackets to basically any shirt I want to wear underneath it. 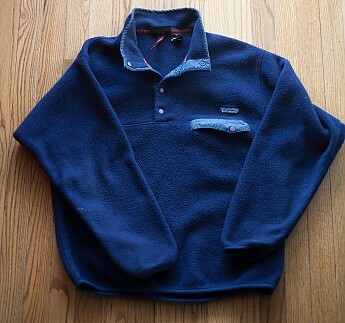 I like that the collar buttons up to cover the entire neck to keep that fall chill from creeping in, and who doesn't like the feel of a fleece pullover when wearing a short sleeved shirt? 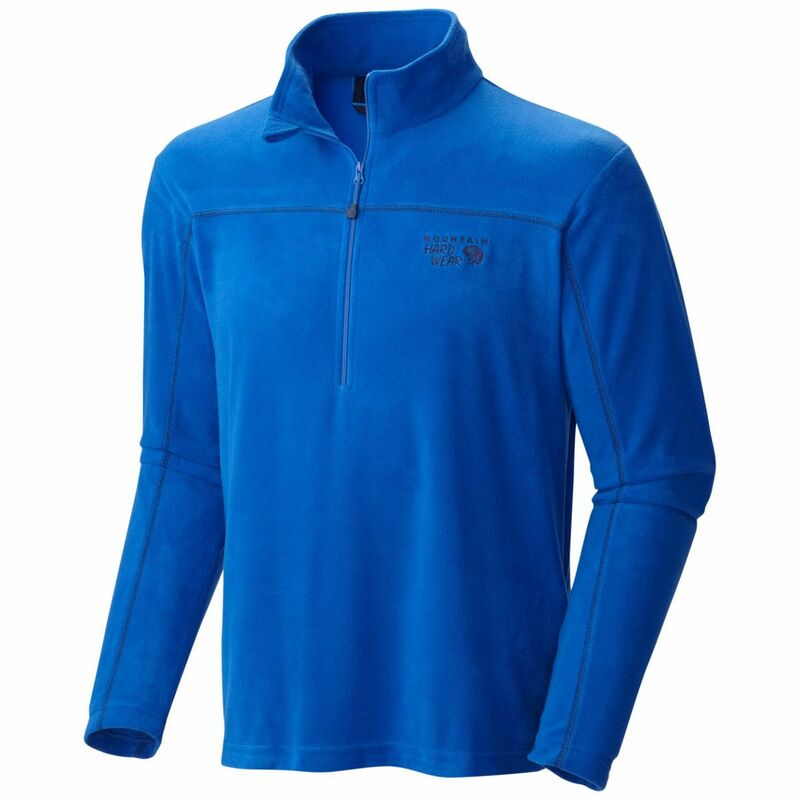 Because it is fleece, the pullover is breathable, which is great in certain instances. But as it gets colder, put a windbreaker on over it, because it does not insulate you if there's a cold breeze. Also, try not to allow it to get wet when while you wear it. That'll make you cold also. I haven't really found a use for the chest pocket yet. It's certainly functional, but it's small and won't hold a ton of stuff. I can put my cell phone in there, but other than that, anything else goes into pockets on my pants. I'm a pockets guy. I like to store things on my person, so I'd like to see some other functional pockets. As a backpacker, I'll say that, being fleece, this does not pack down well. It makes a good fuzzy pillow if I choose not to wear it, but depending on what I'm carrying, it could take up valuable space if I have to carry it in my backpack. But it doesn't weigh much and it's great to wear when setting up camp. I use it all the time for winter hiking. The last negative thing I want to say about this pullover is that it collects lint/hair/dust like crazy. This is par for the course for fleece, but it's worth noting. I don't feel bad about washing it, though, because after countless washings, it's still in really good shape. Overall, this thing is great. I can't think of anything under $100 that holds up to everyday wear for 15 years without needing repair. And, since it's made from recycled soda bottles, it just goes to show that you can help save the environment while looking good and feeling super comfortable. It's super functional that can be used for many different activities. Whatever activities you enjoy doing, you can find a way to work this into your wardrobe. Now that you've read the review, go out and get one. Or save up some money and then get one. It's an investment you won't regret. Hopefully you can see that the fleece is still in great shape, although it has pilled a bit so it's not as fuzzy as it used to be. But the seams and buttons are still in great shape and the spandex at the end of the sleeves and around the waistline are still pretty elastic. I got this in navy blue, and so you can see that the color hasn't really faded at all. You may notice on one of the sleeve there is a white mark...that was from me being careless around a fire...fleece and fire are not a good combination. Just to give you an idea of the size of the chest pocket, this is a standard deck of playing cards. The pocket can hold anything around this size and a little larger. My cell phone is bigger than a deck of cards and it fits in the pocket. Here you may be able to see how the fleece has pilled up a bit, but it's still in great shape, considering it'll be able to get its drivers license next year! Thanks for the review, Adam! I'm stunned you can still wear a shirt you got when you were 11yo!!!!! I've got a couple of fleeces that are 10+ years. I pull 'em out of cold weather car camping. That's pretty sweet that you're still wearing the fleece your grandparents gave you in 5th grade. I'd love to see you add a pic of the fleece, Adam. That's a good idea Alicia! I never think to do that...I'll post it soon. 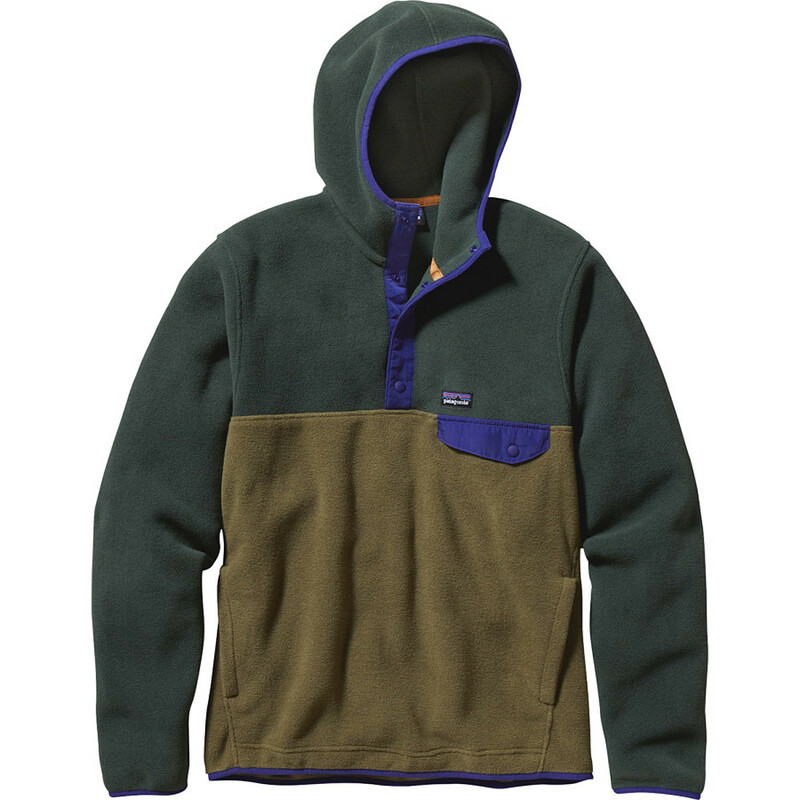 This is a great pullover and I love the lifestyle statement it makes when wearing. 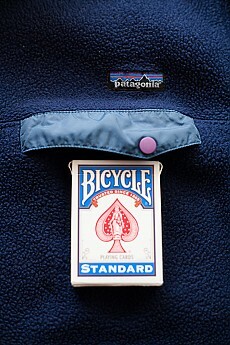 Patagonia is one of the best companies in the world and I love supporting them. 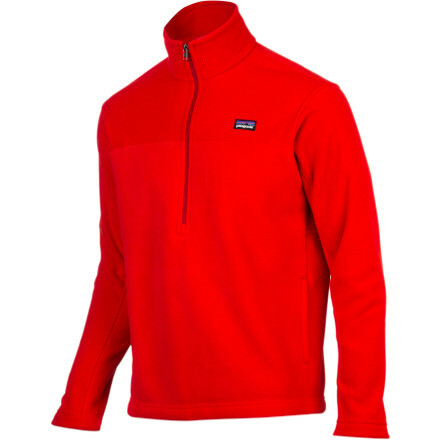 This Snap-T is warm, functional, and works in some less technical layering systems. It's great for rest days and just relaxing in on sunny spring, fall, and winter days. I have worn my Snap-T at Red Rocks, Garden of the Gods, Cheyenne Canyon, Bear Creek Dog Park, etc on sunny fall, winter, and spring days. 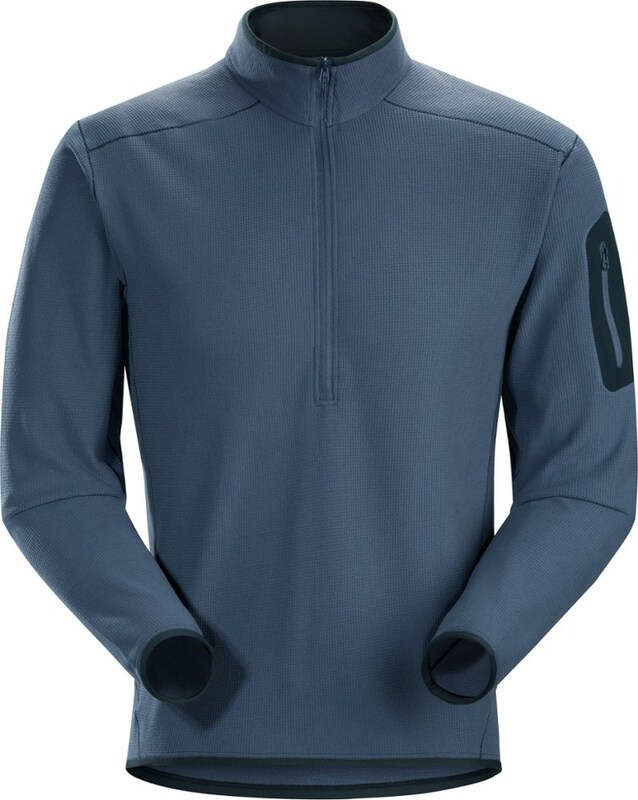 This pullover is great on it own as a layer for temperatures ranging from around 40 to 60F degrees, but then again I'm a freeze baby, so others may be able to get away with wearing it in colder weather. 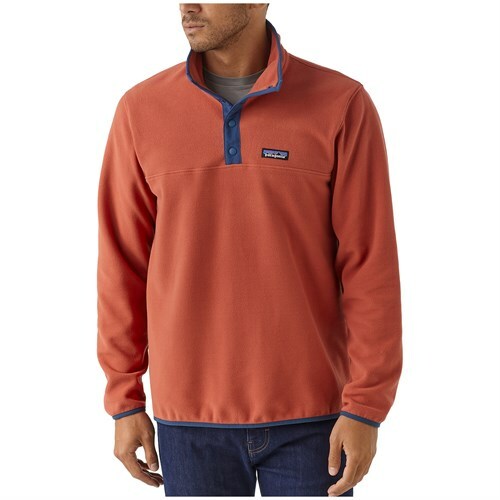 The collar on this shirt is great for windy days to hide behind and the ability to unbutton the shirt so deeply really help vents off some extra heat when it's a little warmer or if you find yourself on a hill a little out of shape in the spring. The buttons are great and have never failed me while the cut and fabric have held up great. Each time I wash the item it snaps back into its original form and the fabric does not hold odor. 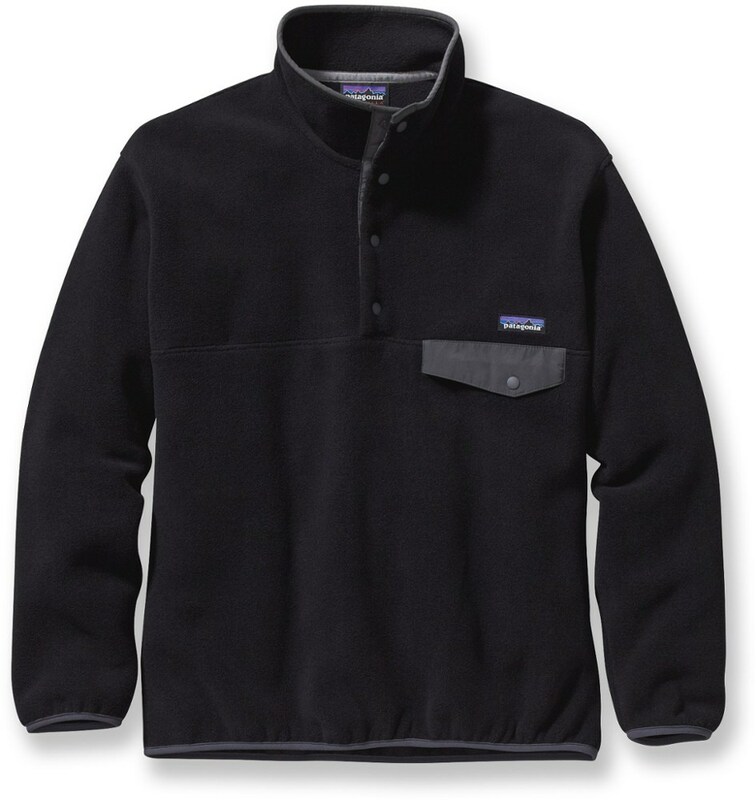 The pullover sheds light snow and precipitation but does not hold up under heavy precipitation, however, it does dry at a fairly reasonable rate for the fabric and how much precipitation it takes for the pull over to get soaked. All in all, I truly believe that everyone should treat themselves to a Snap T or two for style, if they ever plan to hang out around any of the following areas: a climbing crag, any tent, your coach, around a campfire, or at the park walking your dog. I mean what single lady can resist a handsome in shape outdoors man in a Snap-T, with a puppy? Do yourself the favor! Haha Happy Holidays. Welcome to Trailspace, Andy! Thanks for sharing your Snap-T review with us. Got any pictures of it to share in your review? This is the best jacket for the chilly fall days. This is the best jacket for the chilly fall days. Keeps me so warm that I get too hot and need to take it off. It is super cozy for the winter months inside. You'll live in it every day like I do. I even wear it during those chilly summer nights. The fit is true to size. Super cozy during the fall and winter. You cannot adjust the fit, but the fit is great as it is. In the snow, you would need a light rain jacket over it to make it rain proof. There isn't much breathability for use during exercise but does keep you warm all day. It layers well with other winter jackets — it is a good base layer for when you go into the snow. There aren't any pockets on the jacket besides the chest pocket, which is nice to hold a phone and some money/credit card. This jacket is good quality and has held up for me. I wear it almost everyday during the fall and winter months. It's the perfect warm jacket for the winter! Welcome to Trailspace, Susan. If you have a pic of this garment, we'd love to see it! Solid w/o the bulk, always handy to have that chest pocket, perfect anytime of the year. Great to slip on after surfing on an autumn early evening.